“Clinical Trials” redirects here. For the journal, see Clinical Trials (journal). There are two goals to testing medical treatments: to learn whether they work well enough, called “efficacy” or “effectiveness”; and to learn whether they are safe enough, called “safety”. Neither is an absolute criterion; both safety and efficacy are evaluated relative to how the treatment is intended to be used, what other treatments are available, and the severity of the disease or condition. The benefits must outweigh the risks. :8 For example, many drugs to treat cancer have severe side effects that would not be acceptable for an over-the-counter pain medication, yet the cancer drugs have been approved since they are used under a physician’s care, and are used for a life-threatening condition. During the trial, investigators recruit subjects with the predetermined characteristics, administer the treatment(s) and collect data on the subjects’ health for a defined time period. Data include measurements such as vital signs, concentration of the study drug in the blood or tissues, changes to symptoms, and whether improvement or worsening of the condition targeted by the study drug occurs. The researchers send the data to the trial sponsor, who then analyzes the pooled data using statistical tests. Except for small, single-location trials, the design and objectives are specified in a document called a clinical trial protocol. The protocol is the trial’s “operating manual” and ensures that all researchers perform the trial in the same way on similar subjects and that the data is comparable across all subjects. The concepts behind clinical trials are ancient. The Book of Daniel chapter 1, verses 12 through 15, for instance, describes a planned experiment with both baseline and follow-up observations of two groups who either partook of, or did not partake of, “the King’s meat” over a trial period of ten days. Persian physician Avicenna, in The Canon of Medicine (1025) gave similar advice for determining the efficacy of medical drugs and substances. Although early medical experimentation was often performed, the use of a control group to provide an accurate comparison for the demonstration of the intervention’s efficacy, was generally lacking. For instance, Lady Mary Wortley Montagu, who campaigned for the introduction of inoculation (then called variolation) to prevent smallpox, arranged for seven prisoners who had been sentenced to death to undergo variolation in exchange for their life. Although they survived and did not contract smallpox, there was no control group to assess whether this result was due to the inoculation or some other factor. Similar experiments performed by Edward Jenner over his smallpox vaccine were equally conceptually flawed. The first proper clinical trial was conducted by the physician James Lind. The disease scurvy, now known to be caused by a Vitamin C deficiency, would often have terrible effects on the welfare of the crew of long distance ocean voyages. In 1740, the catastrophic result of Anson‘s circumnavigation attracted much attention in Europe; out of 1900 men, 1400 had died, most of them allegedly from having contracted scurvy. John Woodall, an English military surgeon of the British East India Company, had recommended the consumption of citrus fruit (it has an antiscorbutic effect) from the 17th century, but their use did not become widespread. After 1750, the discipline began to take its modern shape. John Haygarth demonstrated the importance of a control group for the correct identification of the placebo effect in his celebrated study of the ineffective remedy called Perkin’s tractors. Further work in that direction was carried out by the eminent physician Sir William Gull, 1st Baronet in the 1860s. In an interventional study, the investigators give the research subjects a particular medicine or other intervention to compare the treated subjects with those receiving no treatment or the standard treatment. Then the researchers measure how the subjects’ health changes. Treatment Research generally involves an intervention such as medication, psychotherapy, new devices, or new approaches to surgery or radiation therapy. A fourth classification is whether the trial design allows changes based on data accumulated during the trial. Fixed trials consider existing data only during the trial’s design, do not modify the trial after it begins and do not assess the results until the study is complete. Adaptive clinical trials use existing data to design the trial, and then use interim results to modify the trial as it proceeds. Modifications include dosage, sample size, drug undergoing trial, patient selection criteria and “cocktail” mix. Adaptive trials often employ a Bayesian experimental design to assess the trial’s progress. In some cases, trials have become an ongoing process that regularly adds and drops therapies and patient groups as more information is gained. The aim is to more quickly identify drugs that have a therapeutic effect and to zero in on patient populations for whom the drug is appropriate. Phase 0 Pharmacodynamics and pharmacokinetics in humans Phase 0 trials are optional first-in-human trials. Single subtherapeutic doses of the study drug or treatment are given to a small number of subjects (typically 10 to 15) to gather preliminary data on the agent’s pharmacodynamics (what the drug does to the body) and pharmacokinetics (what the body does to the drugs). For a test drug, the trial documents the absorption, distribution, metabolization, and removal (excretion) of the drug, and the drug’s interactions within the body, to confirm that these appear to be as expected. Phase 1 Screening for safety Often the first-in-man trials. Testing within a small group of people (typically 20–80) to evaluate safety, determine safe dosage ranges, and begin to identify side effects. A drug’s side effects could be subtle or long term, or may only happen with a few people, so phase 1 trials are not expected to identify all side effects. Blind: The subjects involved in the study do not know which study treatment they receive. If the study is double-blind, the researchers also do not know which treatment a subject receives. This intent is to prevent researchers from treating the two groups differently. A form of double-blind study called a “double-dummy” design allows additional insurance against bias. In this kind of study, all patients are given both placebo and active doses in alternating periods. Clinical studies having small numbers of subjects may be “sponsored” by single researchers or a small group of researchers, and are designed to test simple questions or feasibility to expand the research for a more comprehensive randomized controlled trial. In many cases, giving a placebo to a person suffering from a disease may be unethical. To address this, it has become a common practice to conduct “active comparator” (also known as “active control”) trials. In trials with an active control group, subjects are given either the experimental treatment or a previously approved treatment with known effectiveness. The protocol describes the scientific rationale, objective(s), design, methodology, statistical considerations and organization of the planned trial. Details of the trial are provided in documents referenced in the protocol, such as an investigator’s brochure. Clinical trials recruit study subjects to sign a document representing their “informed consent“. The document includes details such as its purpose, duration, required procedures, risks, potential benefits, key contacts and institutional requirements. The participant then decides whether to sign the document. The document is not a contract, as the participant can withdraw at any time without penalty. Informed consent is a legal process in which a recruit is instructed about key facts before deciding whether to participate. Researchers explain the details of the study in terms the subject can understand. The information is presented in the subject’s native language. Generally, children cannot autonomously provide informed consent, but depending on their age and other factors, may be required to provide informed assent. The number of subjects has a large impact on the ability to reliably detect and measure effects of the intervention. This is described as its “power“. The larger the number of participants, the greater the statistical power and the greater the cost. For drugs that are not expected to have a strong effect (meaning a large number of patients must be recruited to observe ‘any’ effect), recruiting enough patients to test the drug’s effectiveness (i.e., getting statistical power) can take several years. Clinical trials that do not involve a new drug usually have a much shorter duration. (Exceptions are epidemiological studies, such as the Nurses’ Health Study). At a participating site, one or more research assistants (often nurses) do most of the work in conducting the clinical trial. The research assistant’s job can include some or all of the following: providing the local institutional review board (IRB) with the documentation necessary to obtain its permission to conduct the study, assisting with study start-up, identifying eligible patients, obtaining consent from them or their families, administering study treatment(s), collecting and statistically analyzing data, maintaining and updating data files during followup, and communicating with the IRB, as well as the sponsor and CRO. Janet Yang uses the Interactional Justice Model to test the effects of willingness to talk with a doctor and clinical trial enrollment. Results found that potential clinical trial candidates were less likely to enroll in clinical trials if the patient is more willing to talk with their doctor. The reasoning behind this discovery may be patients are happy with their current care. Another reason for the negative relationship between perceived fairness and clinical trial enrollment is the lack of independence from the care provider. Results found that there is a positive relationship between a lack of willingness to talk with their doctor and clinical trial enrollment. Lack of willingness to talk about clinical trials with current care providers may be due to patients’ independence from the doctor. Patients who are less likely to talk about clinical trials are more willing to use other sources of information to gain a better insight of alternative treatments. Clinical trial enrollment should be motivated to utilize websites and television advertising to inform the public about clinical trial enrollment. The last decade has seen a proliferation of information technology use in the planning and conduct of clinical trials. Clinical trial management systems are often used by research sponsors or CROs to help plan and manage the operational aspects of a clinical trial, particularly with respect to investigational sites. Advanced analytics for identifying researchers and research sites with expertise in a given area utilize public and private information about ongoing research. Web-based electronic data capture (EDC) and clinical data management systems are used in a majority of clinical trials to collect case report data from sites, manage its quality and prepare it for analysis. Interactive voice response systems are used by sites to register the enrollment of patients using a phone and to allocate patients to a particular treatment arm (although phones are being increasingly replaced with web-based (IWRS) tools which are sometimes part of the EDC system). While patient-reported outcome were often paper based in the past, measurements are increasingly being collected using web portals or hand-held ePRO (or eDiary) devices, sometimes wireless. Statistical software is used to analyze the collected data and prepare them for regulatory submission. Access to many of these applications are increasingly aggregated in web-based clinical trial portals. In 2011, the FDA approved a phase 1 trial that used telemonitoring, also known as remote patient monitoring, to collect biometric data in patients’ homes and transmit it electronically to the trial database. This technology provides many more data points and is far more convenient for patients, because they have fewer visits to trial sites. Clinical trials are closely supervised by appropriate regulatory authorities. All studies involving a medical or therapeutic intervention on patients must be approved by a supervising ethics committee before permission is granted to run the trial. The local ethics committee has discretion on how it will supervise noninterventional studies (observational studies or those using already collected data). In the US, this body is called the Institutional Review Board (IRB); in the EU, they are called Ethics committees. Most IRBs are located at the local investigator’s hospital or institution, but some sponsors allow the use of a central (independent/for profit) IRB for investigators who work at smaller institutions. To be ethical, researchers must obtain the full and informed consent of participating human subjects. (One of the IRB’s main functions is to ensure potential patients are adequately informed about the clinical trial.) If the patient is unable to consent for him/herself, researchers can seek consent from the patient’s legally authorized representative. In California, the state has prioritized the individuals who can serve as the legally authorized representative. In some US locations, the local IRB must certify researchers and their staff before they can conduct clinical trials. They must understand the federal patient privacy (HIPAA) law and good clinical practice. The International Conference of Harmonisation Guidelines for Good Clinical Practice is a set of standards used internationally for the conduct of clinical trials. The guidelines aim to ensure the “rights, safety and well being of trial subjects are protected”. Informed consent is clearly a ‘necessary’ condition for ethical conduct but does not ‘ensure’ ethical conduct. In compassionate use trials the latter becomes a particularly difficult problem. The final objective is to serve the community of patients or future patients in a best-possible and most responsible way. See also Expanded access. However, it may be hard to turn this objective into a well-defined, quantified, objective function. In some cases this can be done, however, for instance, for questions of when to stop sequential treatments (see Odds algorithm), and then quantified methods may play an important role. Throughout the clinical trial, the sponsor is responsible for accurately informing the local site investigators of the true historical safety record of the drug, device or other medical treatments to be tested, and of any potential interactions of the study treatment(s) with already approved treatments. This allows the local investigators to make an informed judgment on whether to participate in the study or not. The sponsor is also responsible for monitoring the results of the study as they come in from the various sites as the trial proceeds. In larger clinical trials, a sponsor will use the services of a data monitoring committee (DMC, known in the US as a data safety monitoring board). This independent group of clinicians and statisticians meets periodically to review the unblinded data the sponsor has received so far. The DMC has the power to recommend termination of the study based on their review, for example if the study treatment is causing more deaths than the standard treatment, or seems to be causing unexpected and study-related serious adverse events. The sponsor is responsible for collecting adverse event reports from all site investigators in the study, and for informing all the investigators of the sponsor’s judgment as to whether these adverse events were related or not related to the study treatment. The ethical principle of primum non nocere (“first, do no harm”) guides the trial, and if an investigator believes the study treatment may be harming subjects in the study, the investigator can stop participating at any time. On the other hand, investigators often have a financial interest in recruiting subjects, and could act unethically to obtain and maintain their participation. The IRB scrutinizes the study for both medical safety and protection of the patients involved in the study, before it allows the researcher to begin the study. It may require changes in study procedures or in the explanations given to the patient. A required yearly “continuing review” report from the investigator updates the IRB on the progress of the study and any new safety information related to the study. Alternatively, many American pharmaceutical companies have moved some clinical trials overseas. Benefits of conducting trials abroad include lower costs (in some countries) and the ability to run larger trials in shorter timeframes, whereas a potential disadvantage exists in lower-quality trial management. Different countries have different regulatory requirements and enforcement abilities. An estimated 40% of all clinical trials now take place in Asia, Eastern Europe, and Central and South America. “There is no compulsory registration system for clinical trials in these countries and many do not follow European directives in their operations”, says Jacob Sijtsma of the Netherlands-based WEMOS, an advocacy health organisation tracking clinical trials in developing countries. Aggregating safety data across clinical trials during drug development is important because trials are generally designed to focus on determining how well the drug works. The safety data collected and aggregated across multiple trials as the drug is developed allows the sponsor, investigators and regulatory agencies to monitor the aggregate safety profile of experimental medicines as they’re developed. The value of assessing aggregate safety data is: a) decisions based on aggregate safety assessment during development of the medicine can be made throughout the medicine’s development and b) it sets up the sponsor and regulators well for assessing the medicine’s safety after the drug is approved. Investigators are often compensated for their work in clinical trials. These amounts can be small, just covering a partial salary for research assistants and the cost of any supplies (usually the case with national health agency studies), or be substantial and include ‘overhead’ that allows the investigator to pay the research staff during times between clinical trials. Depending on the kind of participants required, sponsors of clinical trials, or contract research organizations working on their behalf, try to find sites with qualified personnel as well as access to patients who could participate in the trial. Working with those sites, they may use various recruitment strategies, including patient databases, newspaper and radio advertisements, flyers, posters in places the patients might go (such as doctor’s offices), and personal recruitment of patients by investigators. Volunteers with specific conditions or diseases have additional online resources to help them locate clinical trials. For example, the Fox Trial Finder connects Parkinson’s disease trials around the world to volunteers who have a specific set of criteria such as location, age, and symptoms. Other disease-specific services exist for volunteers to find trials related to their condition. Volunteers may search directly on ClinicalTrials.gov to locate trials using a registry run by the U.S. National Institutes of Health and National Library of Medicine. 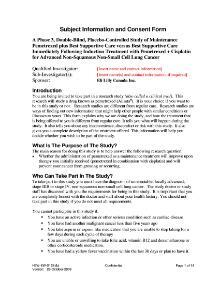 ^ “Clinical Trials” (PDF). Bill and Melinda Gates Foundation. Retrieved 1 January 2014. ^ Dimasi, Joseph A; Grabowski, Henry G; Hansen, Ronald W (2016). “Innovation in the pharmaceutical industry: New estimates of R&D costs”. Journal of Health Economics. 47: 20–33. doi:10.1016/j.jhealeco.2016.01.012. hdl:10161/12742. PMID 26928437. ^ Van Spall HG, Toren A, Kiss A, Fowler RA (March 2007). “Eligibility criteria of randomized controlled trials published in high-impact general medical journals: a systematic sampling review”. JAMA. 297 (11): 1233–40. doi:10.1001/jama.297.11.1233. PMID 17374817. ^ “Medical Devices, Premarket Clinical Studies for Investigational Device Exemption”. US Food and Drug Administration. 17 March 2017. Retrieved 2 October 2017. ^ Lederle FA, Freischlag JA, Kyriakides TC, Padberg FT, Matsumura JS, Kohler TR, Lin PH, Jean-Claude JM, Cikrit DF, Swanson KM, Peduzzi PN (October 2009). “Outcomes following endovascular vs open repair of abdominal aortic aneurysm: a randomized trial”. JAMA. 302 (14): 1535–42. doi:10.1001/jama.2009.1426. PMID 19826022. ^ Lipp A, Shaw C, Glavind K (December 2014). “Mechanical devices for urinary incontinence in women”. The Cochrane Database of Systematic Reviews (12): CD001756. doi:10.1002/14651858.CD001756.pub6. PMID 25517397. ^ Farrokhyar F, Karanicolas PJ, Thoma A, Simunovic M, Bhandari M, Devereaux PJ, Anvari M, Adili A, Guyatt G (March 2010). “Randomized controlled trials of surgical interventions”. Annals of Surgery. 251 (3): 409–16. doi:10.1097/SLA.0b013e3181cf863d. PMID 20142732. ^ Cao AM, Cox MR, Eslick GD (March 2016). “Study design in evidence-based surgery: What is the role of case-control studies?”. World Journal of Methodology. 6 (1): 101–4. doi:10.5662/wjm.v6.i1.101. PMC 4804244. PMID 27019801. ^ Simon, Harvey B. (2002). The Harvard Medical School guide to men’s health. New York: Free Press. p. 31. ISBN 978-0-684-87181-3. ^ “James Lind: A Treatise of the Scurvy (1754)”. 2001. Retrieved 9 September 2007. ^ O’Rourke MF (February 1992). “Frederick Akbar Mahomed”. Hypertension. 19 (2): 212–7. doi:10.1161/01.HYP.19.2.212. PMC 2308176. PMID 1737655. ^ Hani (2009). “Replication study”. Retrieved 27 October 2011. ^ Metcalfe NH (February 2011). “Sir Geoffrey Marshall (1887-1982): respiratory physician, catalyst for anaesthesia development, doctor to both Prime Minister and King, and World War I Barge Commander”. Journal of Medical Biography. 19 (1): 10–4. doi:10.1258/jmb.2010.010019. PMID 21350072. ^ “Glossary of Common Site Terms”. clinicaltrials.gov. Archived from the original on 24 August 2011. ^ Helene S (2010). “EU Compassionate Use Programmes (CUPs): Regulatory Framework and Points to Consider before CUP Implementation”. Pharm Med. 24 (4): 223–229. doi:10.1007/BF03256820. Archived from the original on 7 July 2012. ^ Brennan Z (5 June 2013). “CROs Slowly Shifting to Adaptive Clinical Trial Designs”. Outsourcing-pharma.com. Retrieved 5 January 2014. ^ “Adaptive Clinical Trials for Overcoming Research Challenges”. News-medical.net. 17 September 2013. Retrieved 4 January 2014. ^ Wang, Shirley S. (30 December 2013). “Health: Scientists Look to Improve Cost and Time of Drug Trials – WSJ.com”. Online.wsj.com. Archived from the original on 14 March 2016. Retrieved 4 January 2014. ^ The Lancet (July 2009). “Phase 0 trials: a platform for drug development?”. Lancet. 374 (9685): 176. doi:10.1016/S0140-6736(09)61309-X. PMID 19616703. ^ a b c Hannan EL (June 2008). “Randomized clinical trials and observational studies: guidelines for assessing respective strengths and limitations”. JACC. Cardiovascular Interventions. 1 (3): 211–7. doi:10.1016/j.jcin.2008.01.008. PMID 19463302. ^ Sessler DI, Imrey PB (October 2015). “Clinical Research Methodology 2: Observational Clinical Research”. Anesthesia and Analgesia. 121 (4): 1043–51. doi:10.1213/ANE.0000000000000861. PMID 26378704. ^ Eldridge SM, Lancaster GA, Campbell MJ, Thabane L, Hopewell S, Coleman CL, Bond CM (2016). “Defining Feasibility and Pilot Studies in Preparation for Randomised Controlled Trials: Development of a Conceptual Framework”. PLOS One. 11 (3): e0150205. doi:10.1371/journal.pone.0150205. PMC 4792418. PMID 26978655. ^ “Active Control / Active Comparator”. ^ Young, Susan. “Foundation Medicine Joins Coalition Aiming to Shake Up Cancer Drug Trials | MIT Technology Review”. Technologyreview.com. Retrieved 14 November 2013. ^ “ICH Official web site : ICH”. ich.org. ^ “Learn About Clinical Studies”. clinicaltrials.gov. Archived from the original on 10 April 2012. ^ Norwitz ER, Greenberg JA (2011). “FDA approval for use of medications in pregnancy: an uphill battle”. Reviews in Obstetrics & Gynecology. 4 (2): 39–41. PMC 3218552. PMID 22102925. ^ “Frequently Asked Questions | University of Arizona Cancer Center”. Azcc.arizona.edu. Retrieved 14 November 2013. ^ Webb JE, Crossley MJ, Turner P, Thordarson P (June 2007). “Pyromellitamide aggregates and their response to anion stimuli”. Journal of the American Chemical Society. 129 (22): 7155–62. doi:10.1021/ja0713781. PMID 17497782. ^ Weiss SC, Rowell R, Krochmal L (2008). “Impact of seasonality on conducting clinical studies in dermatology”. Clinics in Dermatology. 26 (5): 565–9. doi:10.1016/j.clindermatol.2008.01.016. PMID 18755376. ^ Khan Y, Tilly S. “Seasonality: The Clinical Trial Manager’s Logistical Challenge” (PDF). Pharm-Olam International. Archived from the original (PDF) on 15 July 2011. Retrieved 26 April 2010. ^ Yang, Z. J., et al. (2010). “Motivation for Health Information Seeking and Processing About Clinical Trial Enrollment.” Health Communication 25(5): 423–436. ^ “BIO to Use ViS Analytics to Streamline Pediatric Clinical Research – WSJ.com”. Online.wsj.com. 7 May 2013. Archived from the original on 4 February 2014. Retrieved 14 November 2013. ^ “Electronic Patient Reported Outcomes (ePRO) – Changing the Face of Clinical Trials”. Med-Quest.org. Retrieved 20 May 2015. ^ “Assembly Bill No. 2328” (PDF). ^ Hayden EC (November 2014). “Ethical dilemma for Ebola drug trials”. Nature. 515 (7526): 177–8. doi:10.1038/515177a. PMID 25391940. ^ Pattinson, Shaun D. (2012). “Emergency research and the interests of participants”. Medical Law International. 12 (2): 121–141. doi:10.1177/0968533212465615. ^ Moynihan, R. (2003). “Who pays for the pizza? Redefining the relationships between doctors and drug companies. 2: Disentanglement”. British Medical Journal. 326 (7400): 1193–1196. doi:10.1136/bmj.326.7400.1193. PMC 1126054. PMID 12775622. ^ “Hogan & Hartson Update on Pharmaceutical Trial Registration” (PDF). 3 March 2008. Archived from the original (PDF) on 25 June 2008. Retrieved 2 June 2008. ^ “Rise in Scientific Journal Retractions Prompts Calls for Reform”. The New York Times. 16 April 2012. Retrieved 22 May 2018. ^ Woolley KL, Lew RA, Stretton S, Ely JA, Bramich NJ, Keys JR, Monk JA, Woolley MJ (June 2011). “Lack of involvement of medical writers and the pharmaceutical industry in publications retracted for misconduct: a systematic, controlled, retrospective study”. Current Medical Research and Opinion. 27 (6): 1175–82. doi:10.1185/03007995.2011.573546. PMID 21473670. ^ Sox HC, Rennie D (August 2008). “Seeding trials: just say “no““. Annals of Internal Medicine. 149 (4): 279–80. doi:10.7326/0003-4819-149-4-200808190-00012. PMID 18711161. ^ “Development & Approval Process (Drugs)”. U.S. Food and Drug Administration. Retrieved 22 May 2018. ^ “Information Sheet Guidance For IRBs, Clinical Investigators, and Sponsors: FDA Inspections of Clinical Investigators” (PDF). June 2010. Retrieved 16 October 2014. ^ Davidoff F, DeAngelis CD, Drazen JM, Nicholls MG, Hoey J, Højgaard L, Horton R, Kotzin S, Nylenna M, Overbeke AJ, Sox HC, Van Der Weyden MB, Wilkes MS (September 2001). “Sponsorship, authorship and accountability”. CMAJ. 165 (6): 786–8. PMC 81460. PMID 11584570. ^ “For Patients: Informed Consent for Clinical Trials”. US Food and Drug Administration. 25 February 2016. Retrieved 9 August 2017. ^ Lang T, Siribaddana S (2012). “Clinical trials have gone global: is this a good thing?”. PLoS Medicine. 9 (6): e1001228. doi:10.1371/journal.pmed.1001228. PMC 3373653. PMID 22719228. ^ “India: Prime Destination for Unethical Clinical Trials”. Common Dreams. ^ “Management of Safety Information from Clinical Trials: Report of CIOMS Working Group VI”. CIOMS Publications. 2005. ^ “Investigational New Drug (IND) Application – Final Rule: Investigational New Drug Safety Reporting Requirements for Human Drug and Biological Products and Safety Reporting Requirements for Bioavailability and Bioequivalence Studies in Humans”. www.fda.gov. Center for Drug Evaluation and Research. 29 September 2010. Retrieved 11 November 2017. ^ “Guidance for Industry and Investigators Safety Reporting Requirements for INDs and BA/BE Studies Small Entity Compliance Guide” (PDF). Food and Drug Administration =. December 2012. ^ “Safety Assessment for IND Safety Reporting Guidance for Industry” (PDF). Food and Drug Administration. December 2015. ^ “Evidence Synthesis and Meta-Analysis: Report of CIOMS Working Group X”. CIOMS Publications. 2016. ^ Sertkaya, Aylin; Wong, Hui-Hsing; Jessup, Amber; Beleche, Trinidad (2016). “Key cost drivers of pharmaceutical clinical trials in the United States”. Clinical Trials. 13 (2): 117–126. doi:10.1177/1740774515625964. PMID 26908540. ^ “Tax Credit for Testing Expenses for Drugs for Rare Diseases or Conditions”. Food and Drug Administration. 17 April 2001. Retrieved 27 March 2007. ^ Paul J, Seib R, Prescott T (March 2005). “The Internet and clinical trials: background, online resources, examples and issues” (Free full text). Journal of Medical Internet Research. 7 (1): e5. doi:10.2196/jmir.7.1.e5. PMC 1550630. PMID 15829477. ^ Liu JJ, Davidson E, Sheikh A (2011). “Achieving Ethnic Diversity in Trial Recruitment”. Pharm Med. 25 (4): 215–222. doi:10.1007/BF03256863. Archived from the original on 14 November 2011. ^ McDonald AM, Knight RC, Campbell MK, Entwistle VA, Grant AM, Cook JA, Elbourne DR, Francis D, Garcia J, Roberts I, Snowdon C (April 2006). “What influences recruitment to randomised controlled trials? A review of trials funded by two UK funding agencies”. Trials. 7: 9. doi:10.1186/1745-6215-7-9. PMC 1475627. PMID 16603070. ^ “Volunteering for a Clinical Trial”. Boston, MA: CenterWatch. 2016. Retrieved 26 November 2016. ^ “How to stop a lack of diversity undermining clinical trial data”. Financial Times. 18 January 2019. Retrieved 26 February 2019. ^ “Parkinson’s Disease Clinical Trials”. Fox Trial Finder. Retrieved 14 November 2013. ^ “Medical Information on the Internet”. Mlanet.org. Archived from the original on 3 October 2013. Retrieved 14 November 2013. ^ a b Yang ZJ, McComas KA, Gay GK, Leonard JP, Dannenberg AJ, Dillon H (2012). “Comparing decision making between cancer patients and the general population: thoughts, emotions, or social influence?”. Journal of Health Communication. 17 (4): 477–94. doi:10.1080/10810730.2011.635774. PMID 22376222. Finn R (1999). Cancer Clinical Trials: Experimental Treatments and How They Can Help You. Sebastopol: O’Reilly & Associates. ISBN 978-1-56592-566-3.